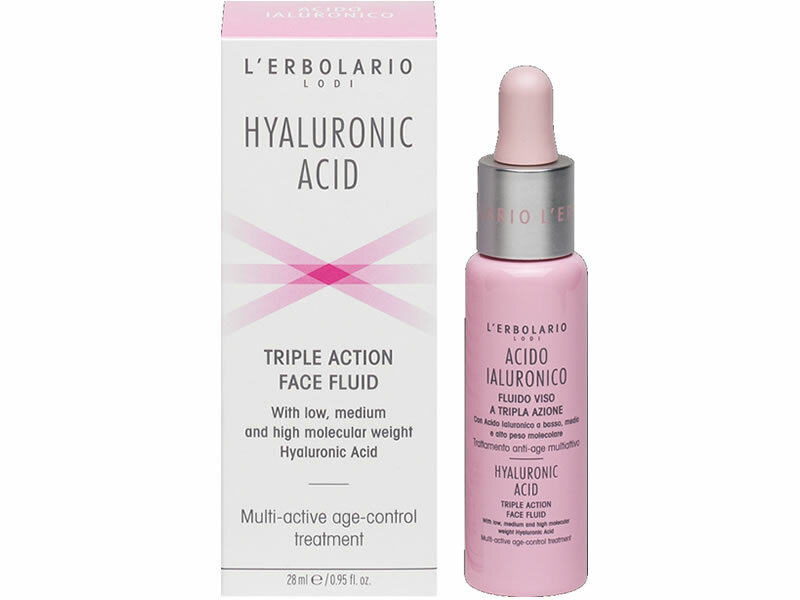 A hydrophilic molecule with the extraordinary capacity of retaining up to one thousand times more water than its weight, Hyaluronic Acid is the cosmetic ingredient around which the formula of this multi-active age-control treatment is designed. With three different molecular weights, it provides plenty of water to your skin whilst reducing evaporation, which tends to take away water from the epidermis, and thereby promotes the physiological production of Collagen. Intensely moisturized, smooth and compact, your face will avoid the risk of dehydration and the resulting appearance of lines, expression lines and creases. Use Apply a few drops on well-cleansed face morning and evening. After the Fluid, always apply the Triple Action Face Cream. Functional substances Low, medium and high molecular weight Hyaluronic Acid. Perfume-free Ingredients (INCI) Aqua (Water), Glycerin, Sodium hyaluronate, Xanthan gum, Citric acid, Benzyl alcohol, Dehydroacetic acid, Potassium sorbate, Sodium benzoate.